Breakfast the most important meal of the day right? I am one busy mom. Between working full time, blogging and having one teen and a tween, getting them fed is super important. Getting kids off and ready for the morning and ensuring they have full bellies is sometimes a struggle. Anything to make my morning easier to lead to a great day is a huge helper! If you are a busy parent like me you fell my pain right? Great Mornings can lead to great days with Jimmy Dean products. 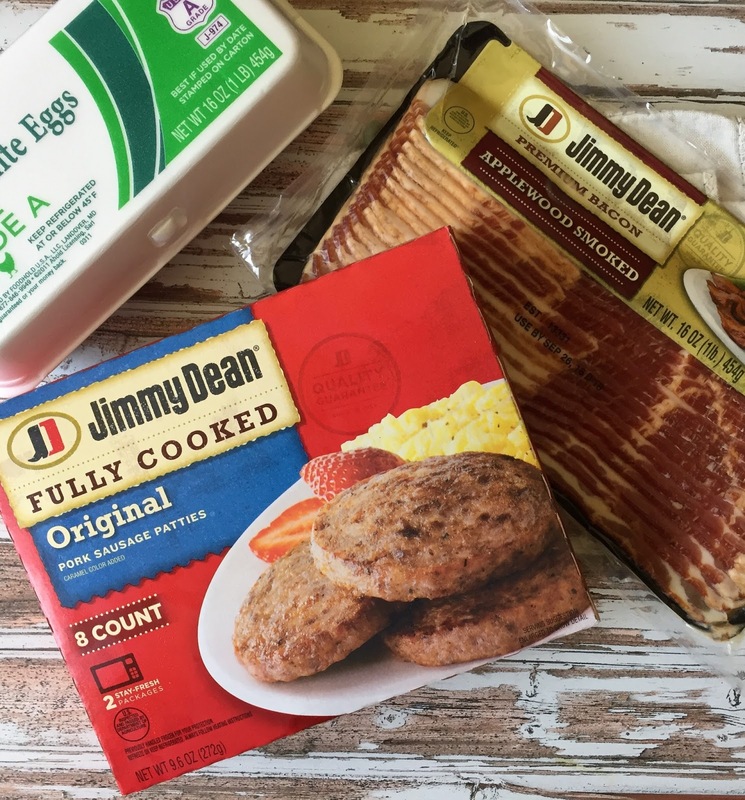 You can make a quick and easy protein rich breakfast recipes using Jimmy Dean products just like I did here. Just stop by your local Stop and Shop and find all of the delicious Jimmy Dean products. They are super easy and super delicious. Amped up herbed scrambled eggs on yummy toast topped with Jimmy Dean Applewood smoked bacon and a side of delicious sausage ready in a snap! Jimmy Dean helps your family get a great start to their morning with a variety of tasty and satisfying breakfast offerings that are ready to enjoy in just minutes! They have so many choices! Just heat & serve! It cuts down your cooking time tremendously. See for yourself how good mornings lead to great days when you start them off with Jimmy Dean. Right now at Stop and Shop when you buy 3 participating Jimmy Dean products you get $5 off through 8/11. While supplies last. Heat the butter in large nonstick skillet over medium heat until hot. Pour in the egg mixture. As eggs begin to set, gently pull the eggs across the pan with a spatula, forming large soft curds. Continue cooking, pulling, lifting and folding eggs, until thickened and no visible liquid egg remains. Do not stir constantly. Remove from heat and serve over the toasted bread sprinkle with bacon and extra herbs. Serve along side heated sausage patties. YUM! Looks absolutely fabulous. Can't wait until this weekend to try it. My kind of breakfast! Thanks for linkin' up with What's Cookin' Wednesday! Thank you for sharing this delicious recipe at the #RecipeSharingParty! I hope to see you next week. Pinned and Yummed. Please visit #OverTheMoon on Sunday, #WonderfulWednesdy or #ThursdayFavoriteThings for more sharing fun! Don't forget to Comment your link #'s so I can be sure to visit and you get a chance to be featured! We love Jimmy Dean products and these Herbed Scrambled Egg Toast look awesome! Hope you are having a fantastic day and thanks so much for sharing with Full Plate Thursday!